improving integrated environmental assessment methods. At its core, the EEAcademy seeks to preserve and nurture a unique body of existing organisational knowledge as well as experiment with new learning approaches in support of continuous knowledge innovation. Integrate new knowledge and practices, tracking latest developments in the sustainability arena, tapping into the new type of knowledge needed to address sustainability challenges. Strengthen the current EEA/Eionet knowledge base, formalising and consolidating existing methodologies, encouraging new approaches and assess their quality and legitimacy in contrast with other approaches. Connecting knowledge and know-how that is otherwise fragmented (addressing integrated assessments, sustainability transitions and systemic challenges in a comprehensive manner). Learning from and building capacity within the Eionet and beyond, supplementing existing education programmes and supporting a community of practitioners in the field. 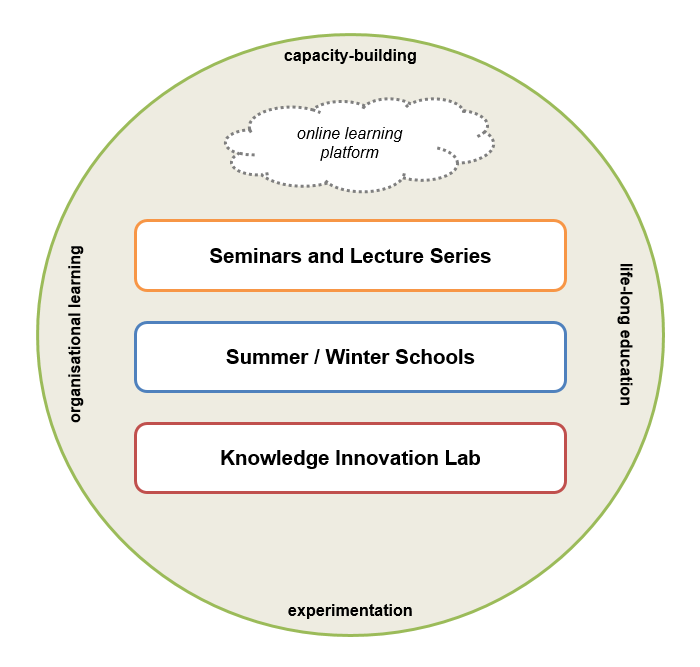 Enhancing collaboration, mutual learning and knowledge sharing – towards the co-creation of knowledge in a transdisciplinary, reflexive approach. Future activities will be carried out in partnership with academia and/or other knowledge communities, including targeted cooperation with existing institutional projects or research activities. It is envisioned to develop an online web-based catalogue of lectures primarily aimed at sharing knowledge within EEA/Eionet. Based on selected strategic content which is open, prospective, and at the cutting edge of systemic innovation and change, with an overarching focus on supporting long-term transitions to sustainability. Attention is put on improving the leverage of existing knowledge and know-how in policy and decision making alongside the Scientific Committee. Primarily aimed at building capacity, these activities seek to enhance and transform the knowledge-base, through hands-on practical approaches applied to the specific working contexts or relevant content. Designed as learning processes, these programmes are normally conducted by joint EEA/Eionet teams, involving experts from partner institutions, academia or research communities. The activities focus on improving the know-how and professional development of knowledge actors and assessors in environmental sustainability especially those working in EEA/Eionet and EU bodies. For references, please go to https://www.eea.europa.eu/about-us/who/eeacademy/eeacademy or scan the QR code.